Bill Northey and Chuck Grassley. The former Iowa Secretary of Agriculture says he was in disbelief when he surveyed flood damage in southwest Iowa and northwest Missouri. “One of those common questions is: ‘Is it as bad as it looks?’ And I’d say: ‘It’s worse than it looks in pictures.’ Even the pictures I took from an airplane doesn’t look like it feels when you look out the window of an airplane and every place you look is water,” Bill Northey said Friday afternoon. 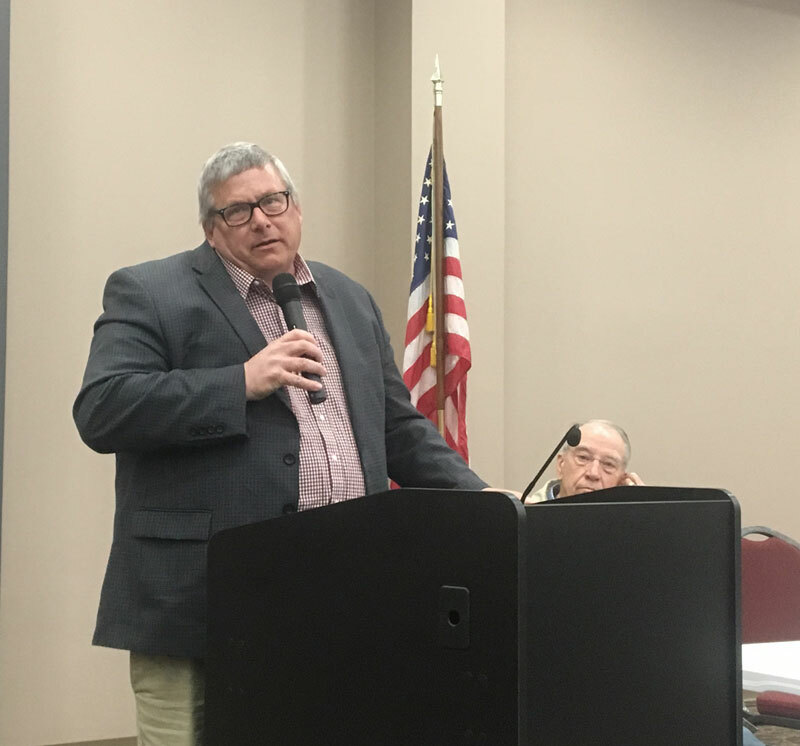 Northey, now an Undersecretary in the U.S.D.A, spoke with producers at a town hall meeting in Malvern late Friday afternoon. Northey fielded a number of questions from area farmers on how they could recover from the second major flood to hit the region in a decade. While saying the federal government can’t cover all the losses, Northey said there are U.S.D.A. programs to soften the blow — like the Emergency Conservation Program. It will pay for three-quarters of the cost of repairing fences and moving sand and silt off fields. Northey also cited the federal crop insurance program’s coverage of prevented planting acres that could help farmers recoup a portion of lost revenue. According to Northey, all the stored grain in bins that’s been ruined by flooding will have a big impact on the farm economy. In most cases, that grain is uninsured. The U.S.D.A. does have a program that pays farmers for livestock lost during a natural disaster. Northey was joined at the forum by Iowa Agriculture Secretary Mike Naig and Iowa Senator Chuck Grassley. Grassley said the Army Corps of Engineers should give flood control a higher priority in its management plan for the Missouri River. “The environmental issues worry more about animals than you do people. I think people ought to be the prime concern of the federal government,” Grassley said and the crowd applauded. Grassley said the dams along with Missouri River were funded by a 1944 federal law called the Flood Control Act.